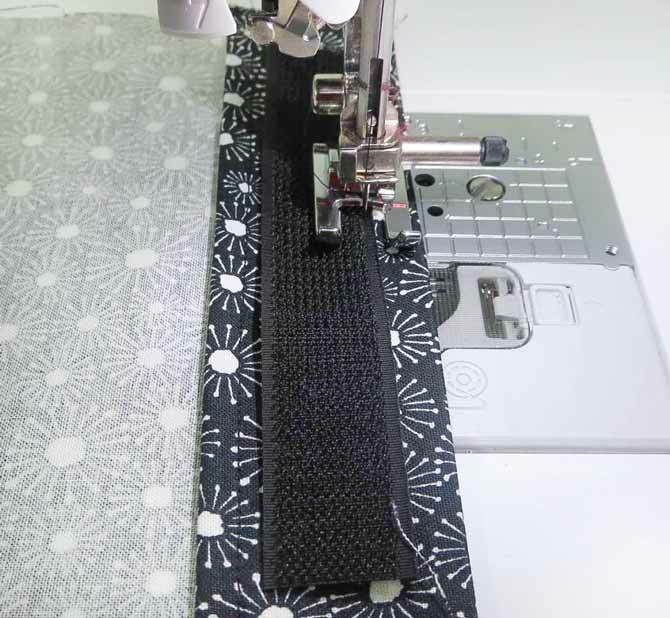 Yesterday I showed you how to get started making a Fidget Quilt using the Brother NQ900 machine. 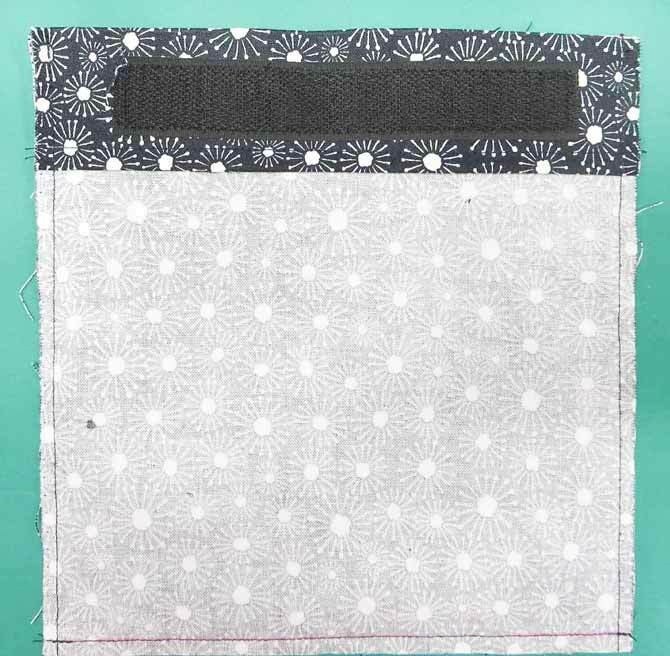 Now I’ll show you how I used decorative stitches and created some pockets to use on this little quilt. There are 240 built-in stitches and 5 lettering fonts. The NQ900 is very user-friendly. You just tap the screen, enter the stitch number and you’re ready to sew. All the stitches are clearly displayed on the flip-up top cover. Here’s a video you can watch for more information on the decorative stitches. 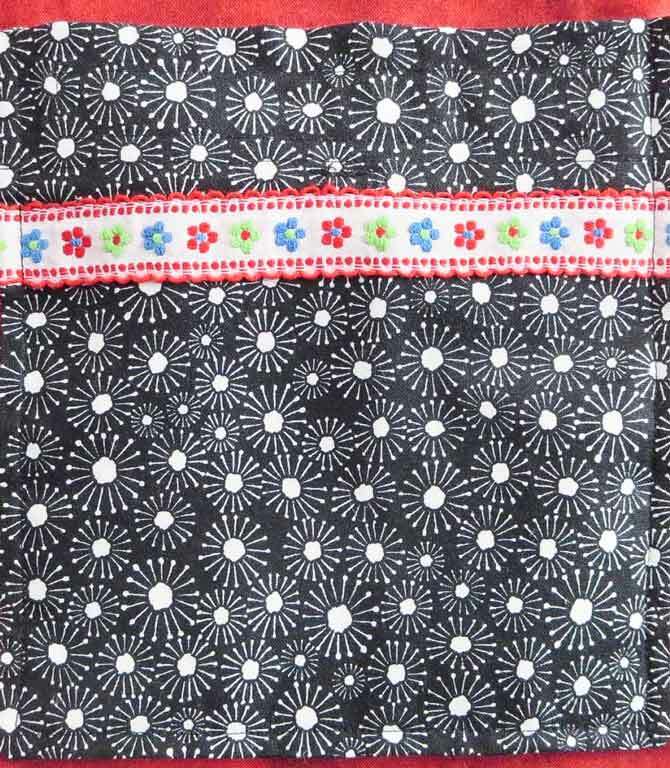 The stitch length and width of many of the stitches are adjustable, which gives you even more creative choices. 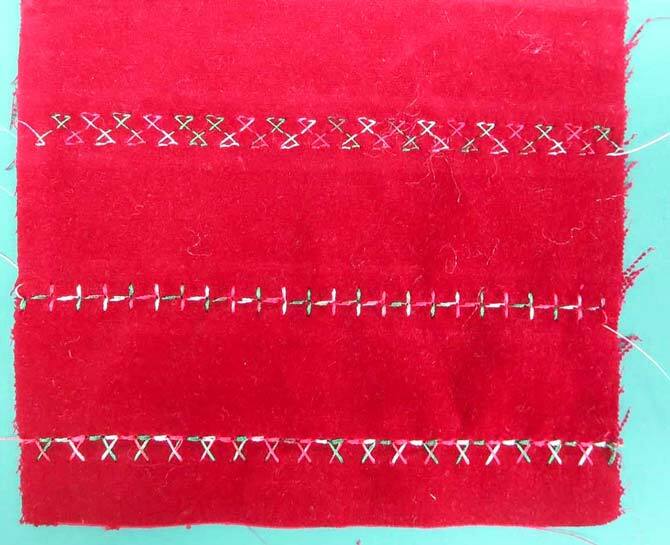 I used a variegated rayon thread and the open toe foot to practice some stitches on a piece of velvet that I wanted to use for a pocket on my Fidget Quilt. The machine had no problem handling this light-weight thread on the heavy fabric. I stitched my velvet pocket front to a piece of cotton, right sides together, across the top. 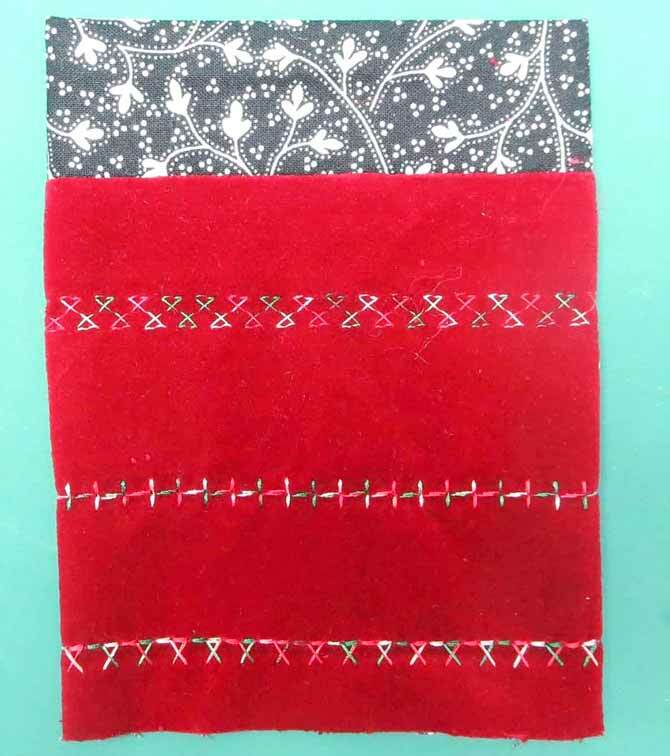 The cotton was about 2″ longer than the velvet, so I lined up the bottom of the velvet pocket with the bottom of the cotton and stitched on the 2 long sides. When turned right-side out, there was a band of the cotton at the top of the velvet pocket and the bottom was left open. I made another pocket, this time using Velcro along the top edges. I used the open toe foot so I could see exactly where to place my stitches. 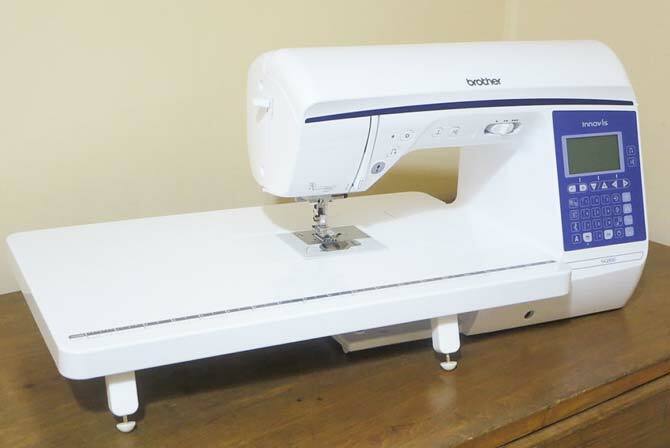 Again, the NQ900 had no problem stitching through the sometimes difficult Velcro strips. I sewed a piece of decorative braid on the pocket front and then the 2 pocket pieces were stitched, right sides together, turned and pressed. Pocket front and back were stitched right sides together. I’ll be featuring a lot more of the decorative stitches on the NQ900 in an upcoming project, so be sure to watch for it on the QUILTsocial blog starting February 27, 2017. 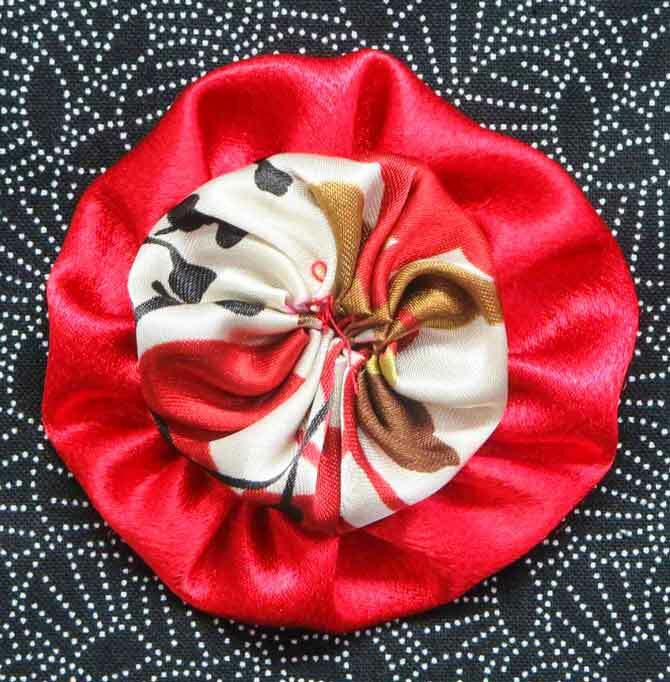 For some added texture on my Fidget quilt, I made 2 yo-yos from a 3½” and a 5″ circle cut from silky polyester fabric. 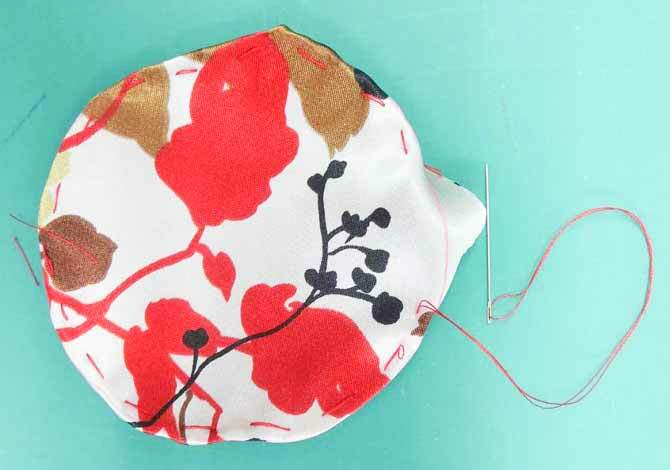 I hand-stitched around the edge of each circle, about ¼” in from the edge, using a long basting stitch. I pulled up the threads to make the yo-yos and then fastened the threads securely. 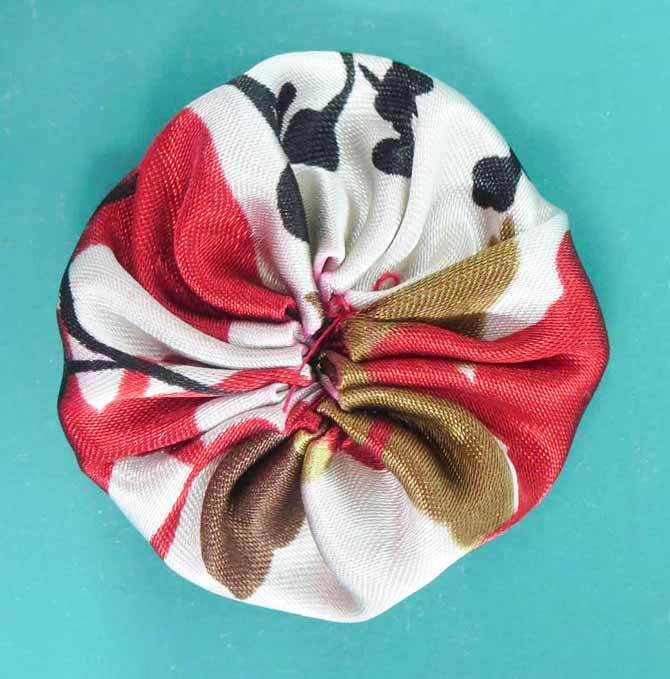 The small yo-yo was stitched to the large one, through the center. Come back tomorrow and I’ll show you how to sew all the bits and pieces together to finish the Fidget Quilt using the Brother NQ900.